If you ask me, the best part about working at the Fine Arts Center is learning about art with talented people from a huge variety of disciplines. Today, I met actor and carpenter James Amos as he was fitting pieces from our traveling exhibition, Emilio Lobato: Mi Linda Soledad (My Beautiful Solitude) into newly built crates. In 1776, Amos plays proud Scotsman and Delaware delegate, Col. Thomas McKean. Despite keeping a busy schedule of theatre performances and stand-up comedy, Amos is also a freelance carpenter. He helped build set designer Chris Sheley's colonial American set for 1776, in addition to the gorgeous Art Deco set designed by Tom Ward for The Women. In the gallery, I see that the crates themselves are a work of art--customized to house this specific show with a foam-cushioned slot for each specific work. The paintings and prints are grouped by size and crate capacity. Says Amos of designing the shipping boxes, "it was definitely a graph paper-intensive project. Compared to the planning, the hammering and nailing was the easy part." 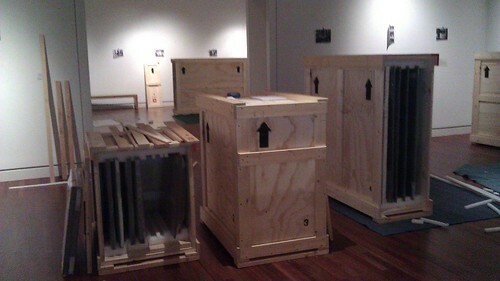 Here's a quick Flickr slideshow of the show getting packed into Amos's custom-built crates before traveling on. And here's my favorite interior shot of a partially packed shipping crate which will house some of Lobato's mid-sized work. The exhibition was developed and curated by Tariana Navas-Nieves. Grant funding from WESTAF (Western States Arts Federation) and NEA (National Endowment for the Arts) made it possible for the show to travel to other western museums. Lobato's mid-career retrospective moves next to Arizona from its critically acclaimed debut here at the FAC. Here's the complete exhibition travel schedule. FAC joins Blue Star Museums for a second year! Time Lapse Set Installation for "1776"
Copyright Colorado Springs Fine Arts Center. Simple theme. Powered by Blogger.